0800DUMPME provide Auckland Waste Removal services for commercial and residential property owners, as well as the building industry. 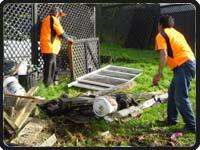 We cover the Greater Auckland area and are happy to cater for single or multiple loads and even single bulky items. We can provide the full service of loading, Waste Removal and site clean-up, in a timely and efficient manner. We strive to reduce any environmental impact by recycling wherever possible and this is enabled by our close contacts with a number of registered charities operating within Auckland. For further details on recycling and reuse opportunities click here to visit the Auckland City Council’s web site register of recycle and reuse options. We DO NOT cater for hazardous waste. Details of the free hazardous waste disposal facilities for householders within the Auckland region can be obtained from Auckland’s HazMobile web site. If you have any questions about our services or would like to discuss any waste management options then please call us on 0800DUMPME.